"Dreamfeet Foam Cushion Dreamfeet Gel Cushion Sole Dreamfeet Gell Sling Backs High Heel Gel Insole Gel Heel Cushion"
Protects Fabrics, Leather Suede and Nubuck from water and Oil based stain. Preserves and Protects. Ideal for use on handbags, boots, shoes, jackets, umbrellas or any items made from leather or fabric. Repels water yet still permits the material to breathe. Spray lightly but evenly over entire article to be treated from a distance of 10cm, let dry, repeat application, let fully dry before wearing. Repeat application from time to time to maintain protection and waterproofed. Dreamfeet Foam Cushions are a lightweight, latex cushioning insole that provides comfort all day long. A Dangerous Goods Surcharge is to be applied to any Aerosol Purchase. This only needs to be applied once. A silky cooling mist that instantly refreshes & deodorises hot weary feet. Instantly cools and refreshes hot, tired, aching feet and gives silky feeling to feet, assists with putting shoes on. Anti-bacterial, sanitises your feet as it deodorises with a fresh new fragrance. Shake well before use, spray evenly all over feet, can be applied directly to bare feet or hosiery, allow to dry before putting on shoes. Do not apply to broken or sensitive skin. Dreamfeet Gel Cushions provide all day invisible cushioning to help prevent the burning pain in the balls of your feet. Ideal for use in all shoe types including your much loved sandals and boots. Simply peel and place. Pointed heel facing the heel. 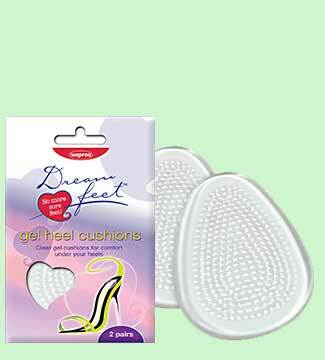 Dreamfeet Gel Heel Cushions provide invisible cushioning to help prevent the burning pain in your heels. Simply Peel and Place, pointed end facing the toe. 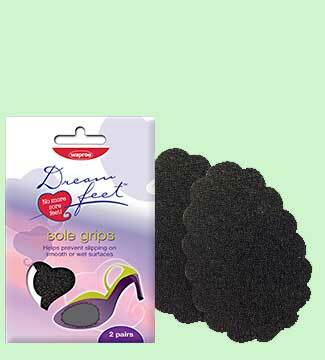 Dreamfeet Gel Heel Grips are ideal for use in shoes with a heel counter. Dreamfeet Gel Sling Backs are ideal for use on straps and sling backs. Protect your Stiletto Heels from Sinking into the grass, Slipping on the dance floor, Catching in the escalator, Sliding on the boat deck, Sticking in grooves, Scuffing on paving. Perfect for: racedays, weddings, garden parties and other social events. Black heel stoppers come in a sheer black organza bag, and clear with a white organza bag. 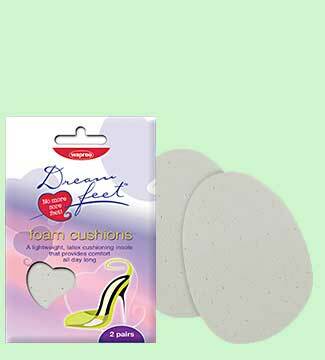 Dreamfeet High Heel Gel Insoles provide all day cushioning to help prevent the burning pain in the balls and heels of your feet. Ideal for use in open or closed in shoes and sandals. 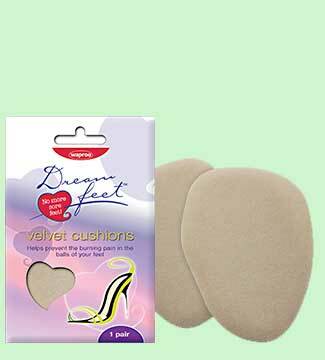 Dreamfeet High Heel Velvet Insoles provide all day cushioning to help prevent the burning pain in the balls and heels of your feet. Ideal for use in open or closed in shoes and sandals. Simply Peel and Place, with the smaller end facing the heel. 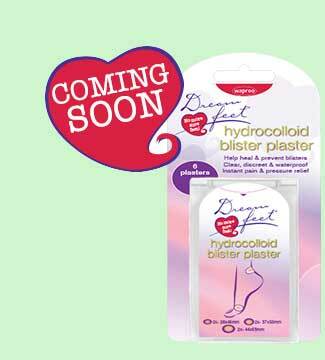 Dreamfeet Blister Plaster provides healing and protection for blisters. Help heal and prevent blisters. Instant pain and pressure relief. Clear, discreet and waterproof. Each plaster contains a hydrocolloid island pad, which absorbs excess moisture from the skin and helps create the ideal healing conditions. Ensure feet are clean and dry. Remove plaster from backing paper, apply centrally over blister, press all around the edge. Once the plaster is firmly in position, remove the clear film and ensure all edges are smoothly adhered to skin. Cleans and shines all colours of leather and pleather instantly. No polishing or buffing required! Ensure the surface is free from dust and dirt. Dreamfeet Leather Freshfoot Insoles with shock absorbing charcoal activated foam, helps control foot odour whilst keeping you comfortable all day long. Peel adhesive tape off cushions and insert cushions into shoe sticky side down. May be worn either way up. Use as a fitting aid for loose shoes and to push foot away from toe box or use as ball of foot comfort cushion. Dreamfeet Microfibre Polish Cloth lifts and locks dirt and moisture deep within its fibres. It polishes more effectively, reaching into surface pores and crevices better than a cotton cloth can. Use wet to clean, and dry to polish. 80% Polyester, 20% Polyamide. Machine wash warm separately. Tumble dry low or air dry. No fabric softener or bleach. A great general purpose dusting and cleaning cloth, also ideal for use on computer screens, TV screens, spectacles, sunglasses. Dreamfeet Shoe Shapers are the essential travel companion for your shoes. These shoe shapers keep your shoes intact and perfectly shaped for your next outing. Place inside front of shoe to stop shoes from creasing and flattening. Extends the life of your shoes. Cleans & refreshes all vinyl, plastic, rubber, nylon, cork, synthetics and faux leather shoes. This mild water based cleanser is easy and quick to use. Simply spray area to be cleaned (can be used inside and outside of shoe) and wipe off dirt and grime with a soft polishing cloth. Leave for 30 seconds or more for tougher marks then gently wipe off. Dreamfeet Sole Grips help prevent slipping on smooth and wet surfaces. Wipe off dirt and grime from shoe sole. Peel off adhesive tape from grip. Attach to sole, smoothing and pressing firmly down. Sticks instantly. Dreamfeet Suede Heel Grips are ideal for use in shoes with a heel counter. Peel suede leather heel grips from backing tape and affix inside the heel counter. Smooth down. Sticks instantly. Dreamfeet Touch Up Polish Pen instantly repairs scuffs and scratches on shoes and heels. Twist gently to bring polish to brush tip. Paint evenly and leave to dry before wearing. Keep lid tightly secured after use. Dreamfeet Velvet Cushions provide all day cushioning to help prevent the burning pain in the balls of your feet. Ideal for use in all shoe types including your much loved sandals and boots. Peel cushions off protective film and insert into shoe sticky side down with the pointed end facing the heel.